Find out about the fate of Angeline Morrard's daughter from Captain Aldis. "Have you been to Whiterun?" Talk to Angeline Morrard in Angeline's Aromatics. Get some news from Captain Aldis. 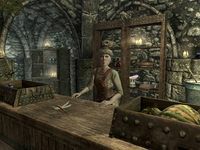 Angeline Morrard is the shopkeeper of Angeline's Aromatics in Solitude. In your conversation with her, she will ask you if you have been to Whiterun. If you tell her that you haven't been there before, she will be understanding and you can talk to her about it later. If you tell her that you have indeed been to Whiterun, she will become very animated. It seems her daughter, Fura, was assigned to Whiterun after she joined the Imperial Army and Angeline was hoping to get some recent news about her. Although Angeline has tried contacting Captain Aldis, she didn't get any information from him. If you are willing to help her get more information about her daughter, anything you can find out would be welcome. 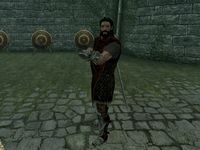 Captain Aldis can be found training the guards in the courtyard of Castle Dour during the day. When you tell him that Angeline sent you for information about her daughter, Aldis will respond, "Generally posting information is need to know only". Several options are available for you to continue the conversation, including persuasion and intimidation. You must pass an easy Speech check to persuade him to reveal Fura's fate. I think Angela [sic] needs to know. (Persuade) Passed: I... I've been trying to find the time and place to let her know. Well, I'm making it "need to know." (Intimidate) Passed: If you want to know that bad then fine. "She needs to be told." The captain will then give you the news: "Her daughter was sent to Whiterun, the skirmishes there have been violent. The whiterun [sic] legate, he needed to know the Stormcloak positions. He sent out a party to scout the area. They happened upon a large force... I'm told none of them made it back. Private Morrard... Angela's [sic] daughter was in that scouting party. She needs to be told". Return to Angeline Morrard with the news. Angeline is eager to hear about her daughter. She is understandably grief-stricken when you tell her the bad news: "I told her. I told her the imperial [sic] army would kill her. That this was a war of Jarls and Imperial Generals and we had no part in it. She just wouldn't hear it". Angeline can't thank you for the news, "not for this", but she acknowledges that you have done her a service. You get no reward from her, but she will have a more friendly disposition towards you and allow you to freely take many low-value items in her shop. If you have completed the Stormcloak missions, especially Battle for Solitude, before speaking with Aldis, this quest will be impossible to finish as it would lead you to a bare area where Aldis once stood. Because of this, it is highly recommended this quest is done before finishing the Stormcloak missions. This can also be fixed by entering the following in the console: setstage SolitudeFreeform01 20. This will set the stage of the quest to where you have to return to Angeline, and will allow you to complete the quest. Objective 10: Ask Aldis for information about Angeline's daughter. Objective 20: Tell Angeline what Aldis said. The following empty quest stages were omitted from the table: 0, 5. On the PC, it is possible to use the console to advance through the quest by entering setstage SolitudeFreeform01 stage, where stage is the number of the stage you wish to complete. It is not possible to un-complete (i.e. go back) quest stages, but it is possible to clear all stages of the quest using resetquest SolitudeFreeform01.